And so, it is our special joy and privilege to pray for the Church, the world, for Priests and Seminarians, and for all those who request or prayers. 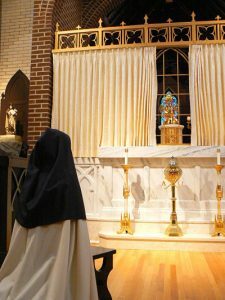 The Sisters will present your petitions to Our Lord in the Blessed Sacrament during the Holy Sacrifice of the Mass, all the Hours of the daily Divine Office and our other hours of prayer. God bless you!